In the first half of 2012, the California Center for Sustainable Energy (CCSE), in coordination with the California Air Resources Board (ARB), conducted the largest plug-in electric vehicle owners survey in the state’s history. This edition of Energy 101 highlights the benefits of electric vehicles, including improved fuel efficiency, reduced emissions, and lower maintenance costs. The National Alternative Fuels Training Consortium (NAFTC) is exited to announce Electric Drive Vehicle First Responder Safety Training Train-the-Trainer courses to be conducted nationwide this fall. These free classes will be presented in Santa Monica, CA; Indianapolis, IN; and Morgantown, WV. A limited number of seats will be available at each location. Participants in these Train-the-Trainer courses will receive an instructor manual, instructor CD, a student manual and a First Responder Safety Quick Reference Guide (QRG) for their use in conducting the Electric Drive Vehicle First Responder Safety training. Participants will also receive discounted pricing on future orders of the NAFTC Electric Drive Vehicle First Responder Safety Training materials. Additional information on the NAFTC’s suite of first responder offerings, including our free QRG phone app, can be found at http://afvsafetytraining.com/. This free Train-the-Trainer opportunity will be held on the dates listed below. Please click on the link following each listing to register for your preferred session. Class size is limited. This training will be provided free of charge as part of a U.S. Department of Energy grant under the American Recovery and Reinvestment Act #1RR10033R. Please contact Amy Gandy or Micheal Smyth at 304-293-7882 for more information. Contact via email at Amy.Gandy@mail.wvu.edu orMicheal.Smyth@mail.wvu.edu. 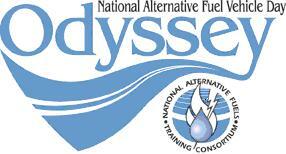 National Alternative Fuel Vehicle (AFV) Day Odyssey 2012. Event Highlights: Mayor’s welcome, Electric and Alternative Fuel Vehicle display, Farmers Market, Food Trucks, and Much Much More!